Lecterns are everywhere we look, but we hardly notice them. Often out of the way and out of mind until we need them, they nevertheless serve a vital function in helping us educate, learn, help and discover. At KPMS we’re proud lectern suppliers, helping businesses and organisations up and down the country with the lecterns they need to function effectively. Often thought of as merely a boardroom or classroom tool though, we sell and ship lecterns to a wide range of businesses. Here’s 8 of the most popular. Places of worship often feature a central figure, reading texts and speaking from their soul on the subject of divinity and faith. It’s a beautiful thing and one which requires a sturdy lectern to accomplish. Our range of lecterns ensures there’s an effective lectern for any place of worship. Conferences are big business, helping individuals from all walks of life share and teach others in large-scale presentations. Needless to say, those notes, laptops and tablets need somewhere to rest – not to mention the microphone. That’s where our range of lecterns come in, with designs to suit any requirement. In teaching environments, having the teacher at a physically higher level than sitting students is valuable for a number of reasons, from eye-contact to discipline. 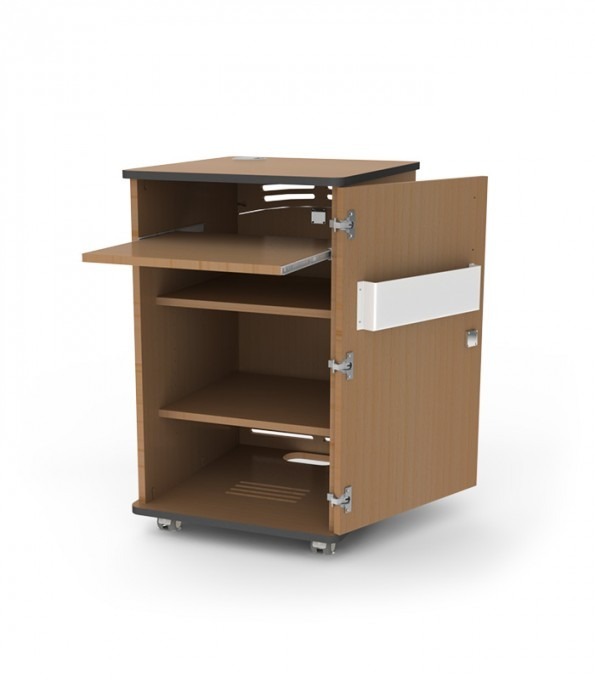 Although less ornate or feature-packed, a basic lectern will suit the requirements for most small classrooms. Surprised? Well, next time you’re waiting for a table at the front of the restaurant, take a look at the desk used by the front of house staff. That’s right, it’s a lectern! It’s the professional touch which lets you know you’re in a high-quality establishment. University education, much more than college, primary or secondary, relies intensely on lectures presented by experts in the field, who, in turn, rely on high-performance lecterns to deliver an effective oration that everyone can hear – it’s why we sell so many lecterns to universities! Hotels across the world pride themselves on their ability to create a comfortable, relaxing and controlled experience for all their guests. As such, many employ front of house or concierge staff which are deployed to help solve problems for customers. Take a closer look and you’ll find that many of these staff operate from behind lecterns. Airport security and concierge staff are well known for operating from behind lecterns as they take up less working space than a standing desk and yet still support the use of electronic items like laptops, PCs and tablets. ‘Check your ticket, sir/madam?’ It’s a phrase we’ve heard countless times, but next time you hear it, take a look at what the staff in question are standing behind. That’s right, it’s a lectern! We supply lecterns to cinema chains, independent cinemas and theatres across the country. At KPMS we’re proud to supply a huge range of lecterns with designs to suit every establishment and prices to suit any budget. Take a look at our full range here and don’t hesitate to get in touch with our team if you have any questions. Previous PostWhat Can Headphones do for your Classroom? Next PostWhat’s the Difference Between Data Projectors and Home Theatre Projectors?